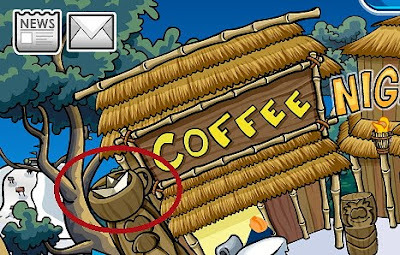 Club Penguin Cheats by Mimo777 Club Penguin Cheats by Mimo777: Get Your Club Penguin Island Adventure Party Cheats Here! Get Your Club Penguin Island Adventure Party Cheats Here! Woot woot! The Island Adventure Party is here and it is awesome! To get the FREE member item, do this. Step 2. Go to the Forest. Step 3.Go up the ladder on the tree. 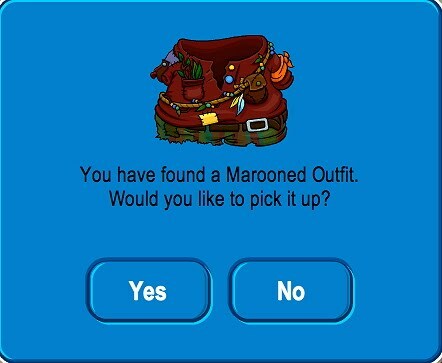 You now have the Marooned Outfit FREE member only item! Boat #6 at the Town in the cup at the Coffee Shop. Boat #7 is at the Ski Village above the Tour Guide booth. 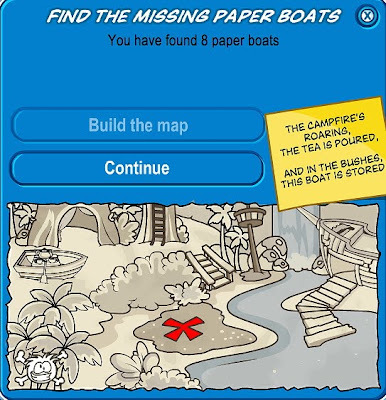 When you do the scavenger hunt and find all the boats, click "Build the map." 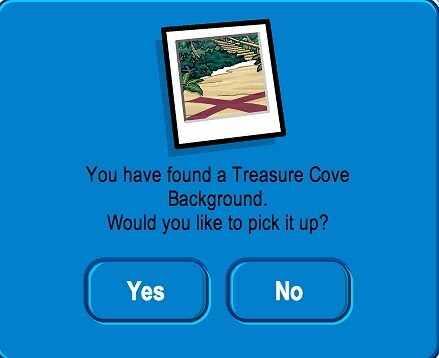 After you build the map, you will get the Treasure Cove Background! You can now go to the cove and dig on the big purple "X." 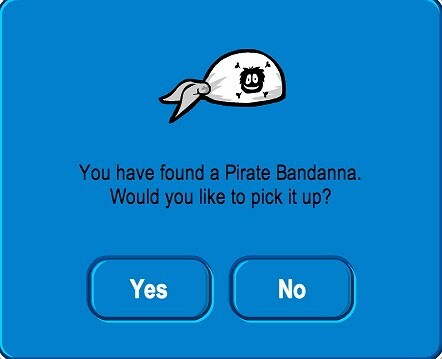 You will get the Pirate Bandanna! It is great to have a NEW item! 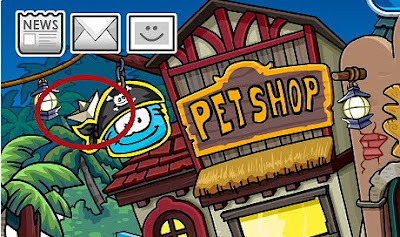 And yes, Rockhopper is getting closer! Woot! Club Penguin has out done themselves with this super, uber, awesome party, don't ya think? Wow, with so much going on, how can we pick a fav? If you have a favorite part of the party, let me know! Wow! this is awesome. Rock on mimio! ahhh! its says item not available!!! after doing the hunt, go to the cove and use a jackhammer to get a white pirate banbdana! 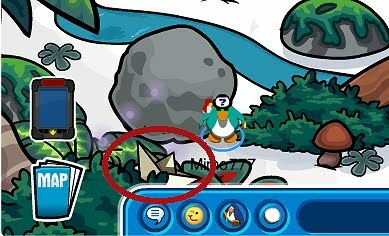 I got the new igloo, and I was reading a book when I noticed that my white puffle was outside the igloo... How??? Sorry for the triple question marks, but I decided that a puzzle such as this deserves multiple emphasis. I couldn't go out of the confines of the fish bowl (except to leave my home completely, of course), but my puffles were outside and inside as they pleased. Only for one of them, the other you have to complete the scavanger hunt for. thx mimo ur the best! I wonder where the squid lid item is..
the outfit is for members. the only free item is the bandanna and the background. I bet they needed a place to use the bathroom! Lol. I love this party! But..... there is no ruin pool! :( that was my favorite! It is pretty cool though! I love the fall fair parties! That's odd... it's probably just a glitch. 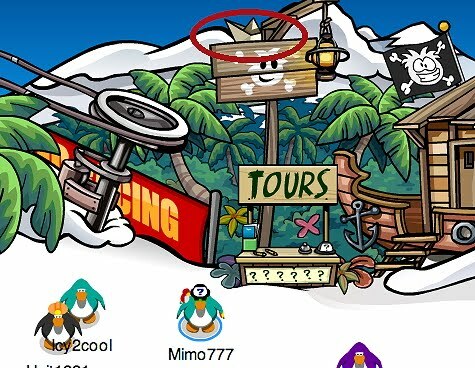 :O the pirate hat is so spiffy! Hmm.. I forgot all about that. Rockhopper will probably bring it when he comes... and I hope it's not for member's only. Yea, I feel better now... Oh I mean, yea it is awesome! Waddle On! Pirates! Navy's have no chance! Unless of course they started to shoot bowling balls at us. Not all of them. Non members can get a background and a puffle bandana. Oh yea, that was supposed to come out this month wasn't it? Maybe after this party. We'll see. I would definitely, serously, positively call that a big, fat, gruesome... glitch. lol. If it keeps happining email costomer service. Awesome! I love this party!! Mimo do you know that at the forest, there is a big stone on the bottom left which can led you to the Hidden Lake? 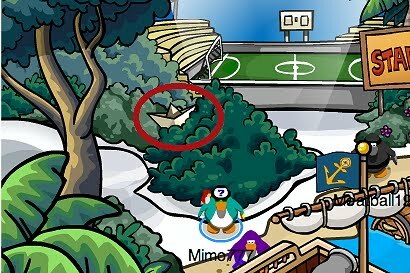 And when you go to the beach there is a boat you can go to there for the ship battle! The boat with an arrow of top in cove also led you to the ship battle!! My friend doesn't seem to be a member, but she was in the Mermaid Cove? 'Nother question, how come all the new igloos in the catalogue don't open their doors anymore when you roll over them? suppose music jam is next month. 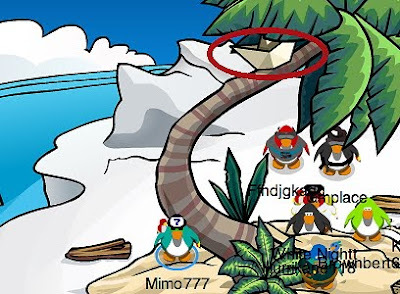 Mimo if you click on the rock in the forest it will get you to the underground cave. My favorite part of the party is the battle ships! It's awesome that everyone can see the holes in the ship! Rock on! 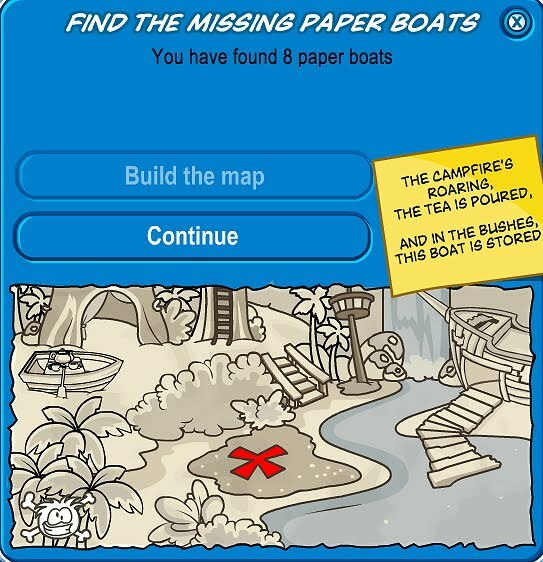 I know why there are paper boats!! 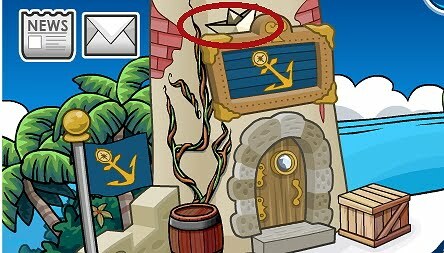 Because last year, the Ship Igloo blueprints were contained and then became an igloo! 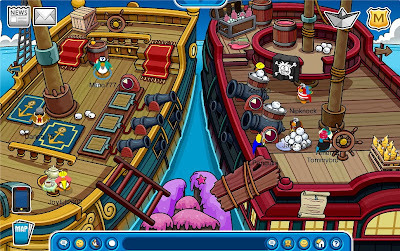 Do you think that the ship igloo might COME BACK?! it should be PUFFLE BANDANNA!! My favorite part is the pirate war for members. i fineshed my memebership 1 day ago!!!! p.s. mimmo i want 2 b ur friend on cp U ROCK!! Me too. 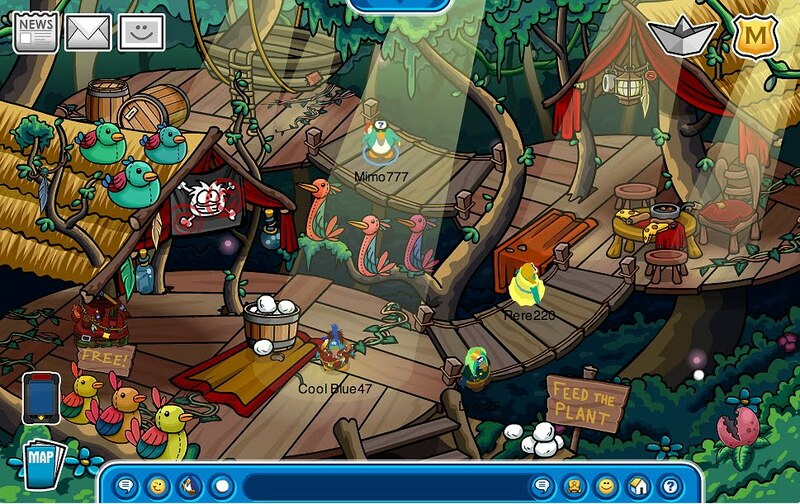 My membership expired just when the halloween party,puffle party, & medieval party started. The Mermaid Cove isnt a Member Room but the room with the moss pin is. 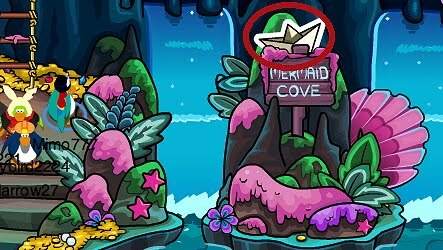 I'm a non-member too and i can go into the Mermaid Cove, i thnk it's for both cuz there is a special little boat inside it. Shhhh... i wasn't supposed to give that away. My friend just got the Pirate boat igloo... I'm not sure if it was a glitch because before that she had the pink igloo. I suspect it might come. i think its a glitch, and the regular iglos (snowy baclyard igloo, split level igloo e.t.c) are longer,so they usually program the puffles to go within those borders. Go near the Drill and it will give u it.. THIS PARTY ROCKS! !- butits not perfect. remember a few posts ago you told us that clubpenguin was losing penguins? well, lots of people comented that they should include non-members more. and this party, they had two non-member items... but they also had one member item and two member rooms. i think they should start changing before penguins log off permenately. Thanks for all the cheats! I think the party is AWESOME! :D However, I wasn't able to get the Pirate Bandanna even though I had completed the scavenger hunt. I received the background. I like the bandanna very much. Please help me! Thank you! Hey mimo I just wanted to let everyone know of something new going on at the Mine Shack, basically, there's this..."ice statue of Herbert" like only halfway done. Thanks Waddle On! 3 words for ya: coolest party eva!!!! Remember you didnt put anything about the secret entrence to the hidden lake which is behind the rock in the forest next to the boat. Mimo is a member but he just dresses like a non member. Yeah lets all beat it waddle on! MAN! !Every time I go to the beach it doesn't load and if it does i can't move or leave the beach! help me! how do i get in the cave in the hidden lake?